My relationship with “The” Macallan goes back to before my whisky journey truly began. I was gifted a bottle of the 25 YO by the husband of a patient. If I had known anything about Scotch I would probably never have accepted it (I was used to $20 bottles of Canadian rye from the LCBO that my father had bought when I was a teen). That gentleman eventually, much later, inspired me to start exploring the world of whisky. I opened a bottle of the 25 back then because my uncle likes Macallan, and though I eventually shared it with my first tasting club, I’m pretty sure that I never really appreciated it as much as others might, or maybe as much as I might appreciate it now. That bottle is long gone, the last ounce reviewed (I thought but can’t find it) by @Victor some time ago. In February 2014 I met @Paddockjudge, and in our first trade he gave me this bottle, at the time his favourite Scotch. When we discovered 8 bottles of this now-discontinued expression selling for $73 each (tax in) in Calgary that year, I opened it to see if I wanted any more bottles. I clearly did. I would have taken them all, but I was happy to stick with 2 spares and I know that the rest are in a special place. This bottle was opened in 2014 and I have poured it sparingly since. I was preparing a sample of something else and looking for something to review and this called to me, so I decanted the last bit of the bottle and was left with about 30 cc which I am sitting with now. It has been gassed after each pour. This Scotch is continuing to open up a half hour after I added water for this review. Stunning! I didn’t realise I liked this as much as this. I think the bottle might have even been better after I first opened it, when the dark prune notes dominated more. I don’t remember the Macallan 25 much, but I would guess that I probably enjoy this expression more. It has full flavour and is not diluted to 43%. Thanks again to @Paddockjudge for introducing me to this Scotch at a time when I would have been satisfied with the sherry bombs of A’Bunadh and Bladnoch. ...and you saw me review Mac CS at 90 points. With the bottle open 2 years my number would have about equaled the 94 points you gave. @Nozinan, great review. You are not deluding yourself about Macallan Cask Strength getting better with air exposure. Let it sit a couple of years in an open bottle and the fruitiness on the nose will blow you away like a bomb. It gets impossibly fruity. I think that if I had seen the air effects on Mac CS sooner that I might have put aside a lot more bottles of it than I did. I only have 2 bottles now, but if I had my d'ruthers I'd have at least 6 or 8 of them in my stored stock right now. Important to note is that this North American release of Macallan Cask Strength has impeccably clean sherry, without a hint of sulphur present. The same cannot be said for many releases of, say, Macallan 18 yo. And so departs The Maccallan Cask Strength from my shelf. This one, I'm sad to see go. An outstanding Single Malt. This one is probably one of the fruitiest whiskey's I've ever tried and this bouquet is delivered with a good stiff punch of Cask Strength 60.1% ABV. Still, it's smooth for a drink this strong. As a side note and this is one of those things that probably only interests me: This drink, upon nosing, makes me sneeze at least half the time. Not sure why this is, exactly, but this is the only Whiskey I've had that does this. NOSE - It is very fruity - Cherry's, Grapes and Black Berries in that order. Within that, you can really smell the Alcohol there as well. PALATTE: Right up front again: Cherry's. Some sugar. It's quite sweet. The grapes and blackberries are there as well though these two seemed stronger on the nose and don't figure as much to me once the drink is in my mouth. FINISH: The finish on this drink is special and it not only lingers but really changes as it fades out. Initially, it numbs the lips a bit and feels almost 'fizzy'. After about 10 seconds, that fades and there's a nice warm feeling left behind. After about 30 seconds, the finish is less fruity to me and almost has a very slight smokey feel before it's gone. Overall, a remarkably smooth and quite drinkable Dram even without adding any water. It's recommended to add a 'splash' of water but I didn't as I liked it just the way it was. This has been 'discontinued' so says the LCBO website here in Ontario so it's probably a good idea to go and sock on of these away. I know I'll be looking for another bottle before they are gone. Once I found out it was being discontinued I grabbed the last bottle I had for sale. Haven't opened it yet but I remember how much I liked it at a tasting years before. Cask Strength is the way to go with excellent whiskey. Why pay for the water?? I have heard a lot about this, the bevmo in my area has it should i save up for a bottle of it as a treat. Well, I think it's possible the bar watered this stuff down because there was NO burn at all without water. I certainly didn't need to pour any in my glass. Nose: Sea salt caramel, vanilla bean, figs, cream sherry, spices. Palette: A sugar bomb that will explode in your mouth (unless you spit it out, which I would certainly not advise). More caramel, vanilla creaminess, followed by seductively faint hints of smoke that wrap around the sugary confection like a muslin cocoon. Finish: No more smoke, but a hint of pepper accompanies a creamy mouthfeel that transmits yet more sugar, vanilla, beignet, and caramel. Length of finish: almost a full minute for me with the intense notes lasting half that time. Do I even need to suggest that this is an after dinner/desert scotch? My suggestion: skip desert and drink the scotch instead, fat boy. This scotch is almost too sweet for me, but I still enjoyed it. This said, I don't think I could drink more than one glass per evening, however. @redeagle717. The one sold here in Vancouver is bottled as a 10 year old at 58.2%. I wonder if wherever you are you are getting a different version or an older or newer version. The best way to describe this is what comes on the label -- it's a cask-strength version of Macallan, with flavors very reminiscent of the Macallan 12. The higher proof, obviously, brings up the alcohol, both on the nose and through the body of the scotch. The lack of chill filtration brings in a very interesting note on the nose of what I can best describe as the kind of rank, cave-aged notes you'd get from nice cheeses (with which this scotch would pair quite nicely). And the lack of cutting means that all the traditional Macallan flavors are present in abundance: sherry casking, smooth sweetness, and vanilla/citrus notes. All in all, it's not for everyone. I certainly won't be drinking it on a daily basis -- it's just too much for steady consumption. But it does exactly what it says on the label, and if you're in the mood for it, it's really very nice. Worth a try if you like both Macallan's standard line (the 12yo, say), and you also like stronger spirits. Nice review. I found it interesting that you compared this to the Macallan 12. I personally hate the 12 year but loved this. Agree that it is not for everyone but if you can handle the high ABV I think there is great flavor to be found for a relatively inexpensive bottle! 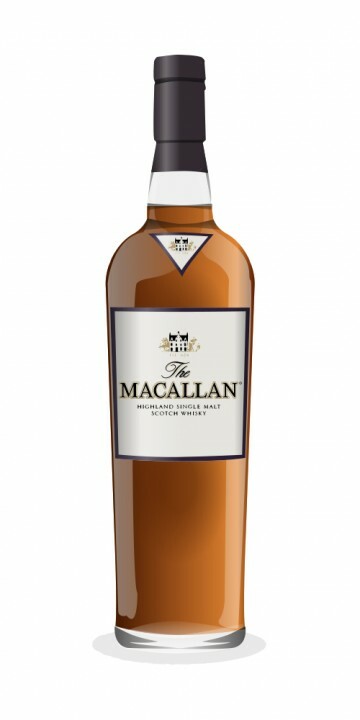 Macallan Cask Strength is undiluted malt aged in used sherry casks. There is no age statement on the bottle. The reviewed bottle has been open for 3 months. Colour: quite dark, from the Sherry cask aging. Nose: a delicious nose of intense grapes, black cherries, and plums, sweet and strong with substantial alcohol, which I like. There is a hint of peat. Taste: crisp, sweet and tart ripe fruits, including grapes, black cherries, and plums. The fruit flavours are sharp and aggressive. There is malt flavour underlying, and a little peat, but you don't notice either of them much. There are also some wood flavours present, but they also are muffled under all of the sherried fruit. There is not much complexity here, but the fruit theme is quite tasty. Finish: long, strong, fruity, and sweet. Delicious. Balance: This is a great choice if you are looking for an aggressive high-test fruity malt. There isn't much wood flavour noticeable, or much grain flavour, and the peating is minimal, but the nose, delivery, and finish of the sherried fruits is quite bright and lovely. This bottle seems to be put into direct comparison with Aberlour Abunadh on a semi-regular basis. As I am lacking in originality tonight, how does the MCS compare/contrast with the Abunadh? I'm particularly interested as they are very similar in price in Ontario (and the MCS, based on the consistently good reviews, seems to be Macallan's 'best value' bottling...albeit in a relative sense). I put some ice in it to cool it down and wait for the ice to melt. I agree that the taste is different ( and better) this way. It needs to be cut quite a bit with water, both due to the alcohol level and to let the different flavors to come out. I didn't like it at all neat or with minimal water, but as summer heated up I tried it with ice and found it very flavorful and pleasant. Before, all I got was heat and cherry cough medicine. Not as complex as A'bunadh, but a better summer dram. Sweet Sherry taste dominates with subtle hints of barely and grape. Wonderfully balanced with a common sherry them throughout. Well blended with a touch of the Macallan spice. Worth the money. So far I’ve only tasted three The Macallan from the Fine Oak series. Those were very good, each of them. Especially the 15 Year Old. Today, however, I tried the Macallan 10 Year Old Cask Strength. Is was bottled at an ABV of 58,4%, too strong for my buds. I felt it best to dilute it for tasting. Undiluted, you are first hit around the ears by alcohol, but with a little patience the sherrytones, accompanied by chocolate, become apparent. Thanks to a few drops of water, the whisky’s complexity increases quite a bit: apple, raisins, roasted nuts and even some orange marmalade. Nice! I feel the ABV puts your throat on fire, so much so that it’s no longer enjoyable. Diluted, however, this is a top notch whisky. The drying oak is followed immediately by a sherry bomb, but there is also a wonderful interplay of citrus fruits and nuts. This is truly complex and delicious. Undiluted the finish is long and seriously spicy but, like mentioned, too strong. Diluted, it remains enjoyable for a long time, nicely spiced, and makes you long for more. No doubt about the fact that this is the best The Macallan I’ve tasted so far. Great stuff! PS. The image does not correspond with the bottle I had (I had the newer one in the red box, 1 litre). Another one for the list of whisky wishes, the second great review I've read of this. This is the first Macallan in my cabinet thus far, and it is undoubtedly a bold one. The nose is an immediate, lingering burst of sherry, dripping with cinnamon-dusted raisins. The body is rich and syrupy, sherry dominating the palate as it does the nose. Again, spices brighten the profile—cinnamon, clove, perhaps even nutmeg. A bit of water helps open this wound-up whisky somewhat, revealing a taste of caramel beneath the surface. The finish is long and generous. I enjoy this dram, especially in the late evening, but I do not find it has the subtlety or complexity of the Aberlour A'bunadh, for instance. The syrupy sherry of The Macallan Cask Strength is lovely, initially, but becomes too much too quickly, needing something to temper it. A good drink on a cold night, certainly, but best in small doses. Hey dbk: Good review! I had tasted this at a Macallan dinner recently. As compared to the others, it was a punch in the mouth! So I decided to taste it again, and the same thing - such a strong start. I let it sit a bit swirling it around every few moments, and reluctant to add ice (I don't like m whisky cold -dulls the flavor), and sipped again, which was a little easier to decipher the flavors. Maybe I was the one being tempered to the boldness of this Macallan! [I also broke my rule of adding a couple of drops of water, which helped me taste even more of the flavor components you had listed above.] There is always a space on my self for a Macallan, so I would definitely add this one. Thanks for the comments, everyone! I reviewed the newer, red boxed version. A previous reviewer of the same bottle, jwise, also suggested ice, but I have to admit I'm not fond of chilling a fine scotch (much like jdcook and BonnieMac) for fear of masking the flavours and, if the ice melts too much, the whisky becomes overly dilute. Ice can be wonderful in certain whisky cocktails, but I'm simply not crazy about adding it elsewhere. As I say in the review, a bit of water indeed opened the dram up—undoubtedly, many high ABV whiskies will benefit from this—but I still found the syrupy sherry to predominate over the other flavours. Then again, I am something of a "green" reviewer, and so my palate is assuredly not as refined as some other "Connosrs." The A'bunadh is an obvious point of comparison to me, but I should probably give it its own, separate review some time in the future. Cheers! On the Nose: Being 116.4 proof, the nose is a bit frustrated by the intense alcohol wafting from the glass! After a few whiffs, the aromas really start to come out. Definitely the strongest aroma is sherry, mixed with caramel. Hints of spice come out as well, but are subdued by the big sherry. It smells wonderful, enveloping my nostrils with fruit and nectar, perhaps baked cinnamon apples!? On the Tongue: Full and rich, coating the palate with warmth. The spice is present from the start, with sweetness coming out from the sides of the mouth. Roll this big whisky around and discover the subtleties. Frankly, tasting this monster neat is going to hide most of its richness. To experience the caramel, you really have to put it on ice. Not only that, but watching this non-chill filtered whisky interact with an ice cube is entertaining in itself. Hold it up to the light and watch strings falling from the cube, creating a haze in the glass. The chilled whisky hits your tongue much differently than when tasted warm and neat. The sweetness gets bigger, with intense caramel flavors coming out the longer you hold it in your mouth! This is my favorite whisky, and I love to enjoy it neat, or with a single cube of ice. The Finish: The finish brings out the sherry, and the proof rating lets itself be known in the LONG finish. Very pleasant for such a big whisky! Hints of oak, but that is mostly drowned out by the spice that kicks the sides of the mouth, and the smell of sherry as it rises into the nostrils. @Jean-Luc - I like the 12yr, but not especially. It is a fine sherried whisky, but not really a stand out. Perhaps it is just a good "go to" whisky, but nothing like the Cask Strength. The Cask Strength only has two rivals: Aberlour A'Bunadh, and Glenfarclas 105. Both cost more than Mac CS, so its a non-issue. If I couldn't find Mac CS, I'd grab one of the other two. Good review, sounds quite intense.